This website is dedicated to the Italian-Americans who served in the armed forces of the United States. Many children of immigrant Italians served in the military. Many gave the ultimate cost of serving. My mother’s brother, Philip Square, served his country during Word War II. My uncle was affectionately known as “Bauch” to his family. Uncle Bauch was a genuine hero. He was awarded a Silver Star, two Bronze Stars, and received a battle field commission. Philip Anthony Square, the third child of Nicola Scacciavillani and Lucia Rossi, was born on December 18, 1918, at his parent’s home on Post Road, Painesville Township, Lake County, Ohio. 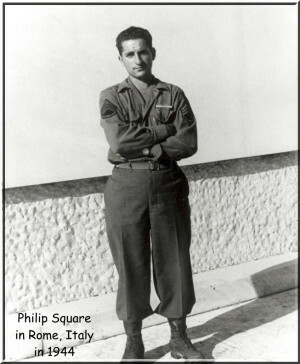 Philip was drafted into the Army of the United States in May, 1942. He was assigned to the United States Fifth Army, 85th Division, 339 Infantry Regiment, Company G. His unit fought in Italy from March 27, 1944, until the end of World War II. He was discharged from the Army at Fort Knox, Kentucky, on December 5, 1945. He was awarded campaign stars for participating in the Rome-Arno, Po Valley, and North Apennine Campaigns. He rose to the permanent rank of technical sergeant (date of grade: October 10, 1944). Philip Square died on February 16, 1978 at Lake County Memorial Hospital, Painesville, Ohio, at age 59 of an acute myocardial infarction. His body is interred at Riverside Cemetery, Painesville. On 11 December 1944, Philip Square was promoted to Second Lieutenant from Enlisted Man status: “T/Sgt Square, Second Platoon, Company “G”, is a natural leader. He has proved it to the satisfaction of his officers and men under the most difficult combat conditions. He has made certain that he has thoroughly understood the company’s mission in each engagement in which he has participated. When his assigned leaders have been wounded, he has assumed command of the platoon and has never become confused or indecisive. He has performed the duties of Platoon Sergeant and Platoon Leader with assurance and distinction. His knowledge of infantry platoon tactics, initiative and aggressiveness have been invaluable in furthering the success of his company. “When his Platoon Leader was wounded on 16 October 1944 in the vicinity of Ca Nova, Italy he assumed command of the platoon. At this time his platoon was isolated from the rest of the company by intense mortar and machine gun fire. He organized and supervised the withdrawal of the platoon through this curtain of fire to aid his company in repelling an enemy counterattack. He succeeded in withdrawing his platoon and carrying the wounded Platoon Leader to the company position without suffering any more casualties. Upon reaching the company position, he organized his platoon in a defensive position. The enemy counterattack was repulsed and the possibility of an enemy breakthrough was eliminated. “On 18 October 1944 he was ordered to take a combat patrol to a defended farm house at Francinatico, Italy, and occupy it. A platoon had previously been captured in this town. He led his platoon over a difficult route in the darkness. Upon reaching the group of buildings he personally led the First Squad around the buildings to attack from the rear, meanwhile holding the rest of the squad in reserve. The unexpectedness of the attack surprised the enemy and they surrendered after firing a few scattered shots. Eight prisoners were taken. He then ran back to his platoon under an intense mortar barrage and led it to the position which he organized defensively. The strong point was taken and held until his company advanced to it. Philip Square was awarded a second Bronze Star Medal. This citation was before September, 1944, and has not been found.